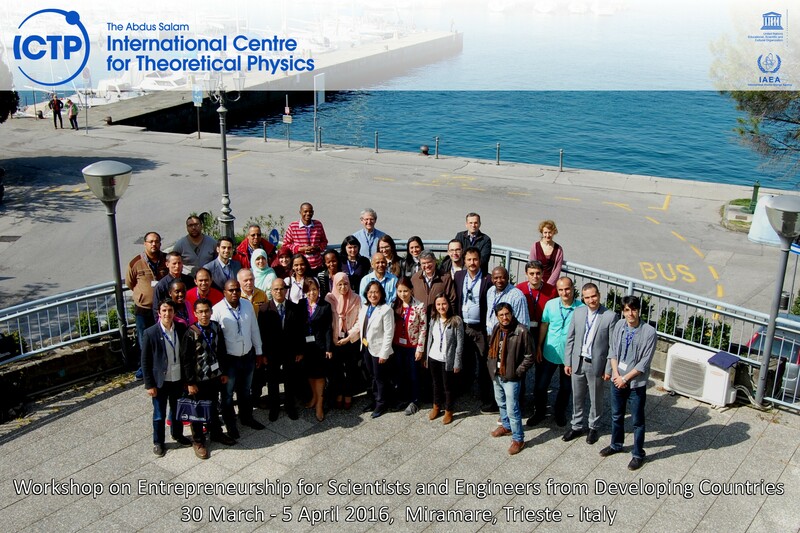 The Abdus Salam International Centre for Theoretical Physics (ICTP), with the co-sponsorship of the APS, of the lOP, of the OSA and of the IEEE has organized a Workshop on Entrepreneurship for Physicists and Engineers from Developing Countries, to be held at ICTP, Trieste, Italy, from 30 March to 5 April 2016. A one-week intensive Workshop for physicists and engineers from developing countries interested in learning entrepreneurial skills to commercialize their scientific inventions. : such an educational programme is missing in many of the developing countries for scientists working in universities and scientific institutions. Topics: • Physicists and Engineers as inventors and entrepreneurs; • Concept of intellectual property (IP) and its significance in developing countries; • Taking science to the market - Timelines and processes for taking an invention to product; • Business model development; • Small business financing and business plan fundamentals; • Marketing the ideas; • Success stories; • Business plan presentation by participants; • Training of lecturers and scientists in development of an "Entrepreneurship Curriculum"